Saturion Ascendant #4 Tk’nxn loved working the Con Nys Dragon perch. No creature could navigate the ever-changing wilds of the Nx’Unia like the Con Nys. They were made to fly across Nx’Unia, the “Great Land”. His people referred to the dragons as Uleq’shra — “magic carpets.” He’d watch, awed, as the Con Nys adapted to its rider; if she was large, the Con Nys enlarged. If it snowed, it grew fur. When it was threatened, it turned sharp. From black smoke, a man appeared. The last thing Tk’nxn saw was the vibrant feathers of his favorite Con Nys turn to blades. The Dragon Shield’s Nest and Nest+ Deck Boxes offer high-end deck protection with a simple design and strong magnetic seal. 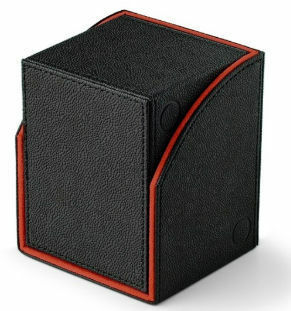 Each Nest and Nest+ has a black exterior and classy colored interior fabric. Nest+ Deck Boxes also include a removable dice tray. Piece all 8 product packages together to discover different parts of the story, “Saturion Ascendant,” to discover the origins of the Nest. As safe as a dragon’s nest. 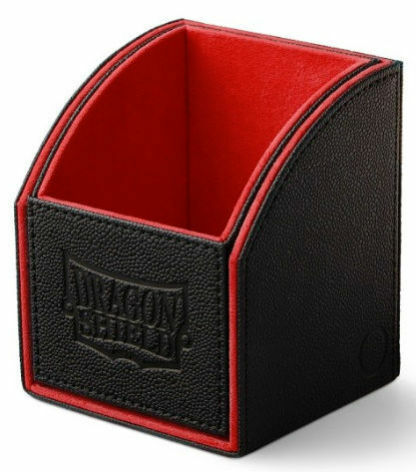 • Extra durable deck box capable of holding 100+ double sleeved cards. • Slick black exterior with classic interior colors. As durable as dragons’ nests. • Customizable assembly.